Lounging in the Bat Cave probably never really sounded that appealing. It's dark, drab, and... well, full of bats! But. That was before you knew you could pack a blanket along. A cozy blanket can really turn everything around. Sure, there will still be a ton of bats, but at least you'll be wrapped up nice and snug. Especially if your blanket has sleeves, and is styled with superhero style! You probably didn't know that blankets came that way, but we're here to make sure you do. 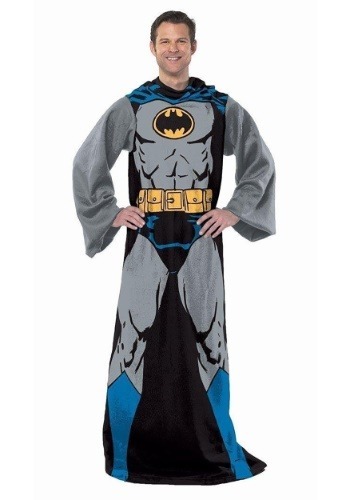 With this Adult Batman Comfy Throw! It has sleeves, and a full character print of Batman's uniform. We think it's time to head to the cave to do some hanging out! DC Comics officially licensed, this blanket is a Comfy Throw, aka the blankets that come with sleeves! Super popular with people who like to snuggle up, this blanket also features costume details of a classic comic book Batman. Which makes it a great selection for fans. 100% polyester, it's made with super soft polyester fleece, and comes in one size to fit most adults. Make it comfy and cozy! Wearing a blanket is sure to make a spooky cave comfy and cozy, and if you think that's a trick, you should see what happens when you use this Batman Adult Comfy Throw right in your own home. It'll be great! Be sure to shop our entire selection of costume inspired apparel and accessories to make your movie night the best around.